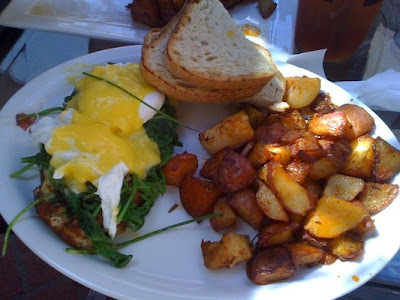 I've been having really yummy brunches these days, but I keep forgetting my camera so I'm borrowing these pics from other reviewers from yelp. First up is BLD, which I discovered is super close to where I live. I've never noticed it before though, shame on me. I've gone to Toast and Doughboys many a times, but after awhile, it gets a bit old and the lines are out of control. The line at BLD was not that much better, but I'm always on the hunt for good brunch spots (aside from the usual IHOP which is unavoidable with Papa Choi), so it was worth it. We had to wait quite a bit so we looked at their menu beforehand and firmly decided on the ricotta blueberry pancakes and the turkey sausage frittata. However, once we got seated, we eyed the couple next to us who was grinning ear to ear and raving about their fried egg sandwich. It looked really good, so we caved and ordered that instead. 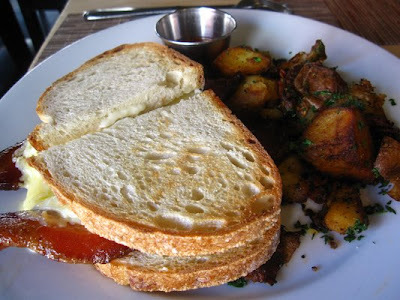 The fried egg sandwich ($13) consisted of toasted sourdough bread, nueske's thick cut bacon, gruyere cheese, aioli and a side of potatoes. I feel like I could attempt to make this sandwich at home, but where can I get my hands on some nueske's thick cut bacon? It was thick and salty and paired wonderfully with the runny, golden egg yolk. Oh my lord. Wanda and I thought it was a bit oily and couldn't figure out where it was coming from, but now that I read the ingredient list, I think it was from the aioli, which melted from the heat. 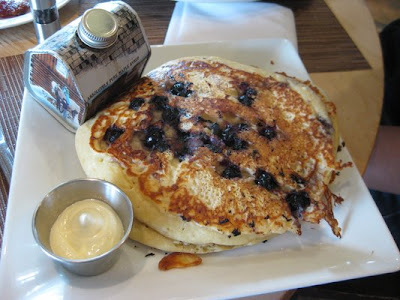 Wanda and I also shared the Ricotta Blueberry Pancakes ($13), which were so fluffy and light. It was served with warm butter and Berkshire maple syrup, which was housed in a cute log cabin tin. Adorable! I am usually not a big fan of pancakes because they end up tasting a bit bready and dry and I end up dousing the whole thing in syrup, but these made a believer out of me. I need this recipe pronto. 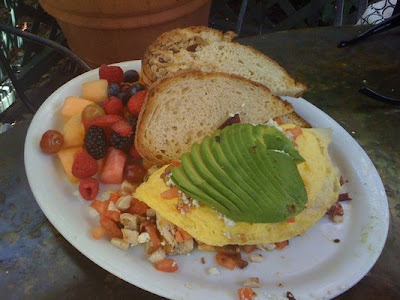 My second recommendation is the Alcove Cafe and Bakery in Los Feliz. We came here after hiking in Griffith Park. It's an outdoor cafe and it feels like you are eating in the front porch of someone's house. It kind of reminded me of The Cottage in La Jolla. They have tables out in front of the cafe and all along the sides. It's a cute place to just sit out and enjoy the California sun with a newspaper in hand and some yummy breakfast. Wanda got the peach crepes ($11.95), which had about 4 thin crepes stuffed with fresh whipped cream infused with espresso and caramelized peaches. It definitely was not enough food for breakfast, but would be a tasty snack or dessert to share. I couldn't find a picture of the crepes. James got the crab cake benedict ($13.95). It had Maryland style crab cakes made from sweet blue crab meat, fresh spinach, two poached eggs on focaccia with hollandaise and fresh chives. I ordered the cobb omelette ($12.95), which had grilled chicken, applewood smoked bacon, point reyes blue cheese, tomato and avocado in it. I don't know why no one thought to make a cobb salad into an omelette before, but it's genius I tell you, genius! They also had a huge dessert case and I am pretty sure they get their cakes from Susina. Usually when my friends have a hunkering for dessert, Susina is my go-to place, but their tables fill up pretty quick, so I think I'll take them to Alcove next time. They have the same desserts and you can sit outside on a warm night.